May 16th, 2017 | Moving Tips, Organizing and Decorating. Self-employment can offer you a lot of freedom and flexibility. However, working from a home office also means that you’re responsible for tasks that would otherwise fall to your employer, and these tasks range from calculating your taxes to transporting your equipment during a move. In this blog, we list seven crucial guidelines that can help you move your work space from your current house to your new home as simply as possible. Your home office likely includes multiple stacks of important papers, letters, and even office supplies. As with any part of your home, you want to declutter and downsize your office as much as possible before the move. Decluttering and packing early will mean you have fewer boxes to transport and that your new office will be more streamlined. Designate a specific period of time just for home-office packing, preferably before you need to start packing up the other rooms in your home. Use this extra time to scan documents, shred sensitive materials, and file away any loose papers. As soon as you have a general time frame for your move, create a schedule that accounts for everything you’ll have to do for work and for moving. Will you need to do any work immediately before the move? What about during your travel time? If possible, ensure that any work that could come close to your moving day can be done from your personal electronic devices rather than your office equipment. Additionally, give yourself time for unpacking before you jump back into your usual work routine. You could need one to two weeks simply to unpack everything. Once you have a definitive move-in date, contact your utility providers for your current house and future home. While fundamental services like electricity and water are simply switched over to your name on the chosen date and don’t need to be “turned on,” you may have other steps to complete before you can return to business as usual. For example, if you perform work tasks or communicate with your clients online, you won’t be able to work from home until you have Internet service. Schedule the utility transfer two to four weeks in advance to ensure that you’re connected when it counts. If you work directly with your clients, make sure that they know your schedule and how to reach you if an urgent problem arises. If you don’t often speak to your clients via chat, text, phone, or video-chat conversations, you may want to provide multiple forms of notification to ensure that everyone knows you’ll be away from your desk for the duration of your move. For example, you may want to send out a form email or traditional letter and change your voicemail message to reflect the scheduling change. Don’t forget to provide your customers with your new address and any altered contact information as soon as you return to work. Many of the items found in a home office, from furnishings to books, can weigh down your moving boxes and make them difficult to carry. If you have several boxes of documents, books, expensive electronics, or other heavy items, plan ahead. You will probably need assistance to carry, load, and unload these items. Consider hiring a professional moving team to handle these heavy containers. While your family members may be able to lift boxes full of business records, they may not know how to handle packages that are both heavy and fragile, like your desktop computer. A moving team can ensure that these items arrive at your new home office safely. Determine the layout of your new office space. If possible, walk through the room and take measurements before your boxes are delivered. 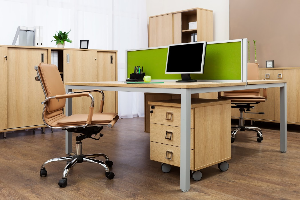 Check that your existing furnishing will fit into the space to create a functional and inviting work area. You may want to sketch out your planned layout or use damage-free painter’s tape to mark where your office furniture will go. This step reduces the time necessary to unpack your office and return the room to its usual function. As you pack up, try to use your office staples in creative ways to simplify the moving process. For example, if you keep writing utensils, fasteners, and other supplies in a bookcase, you may be able to tape the drawers shut and load up the bookcase as is. If you’ve invested time organizing a specific part of your office, smart moving choices can ensure that you don’t have to go through the tedious process again just because you changed locations. No matter what services you provide from your home office, use these tips to ensure that you can get back to business as usual as soon as you arrive at your new home.